Raw lobster lies on ice. Big brown lobster. Seafood about to be boiled. Expensive delicacy served at cafe. Lobster moving his claw. 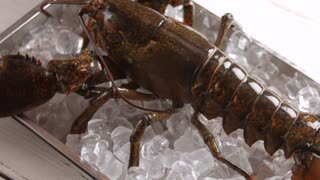 Live lobster lies on ice. Out of native environment. Delicacy served at local restaurant. Lobster moves his mouth. 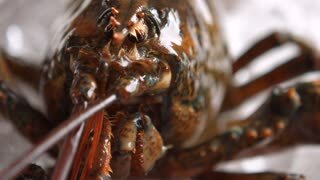 Head of brown lobster. What is this place. Reacting to new environment.